John Dory is sometimes a little hard to find here, but well worth grabbing when you spot it. This basic sauce is just perfect for this fish but any white flesh fish can be used. I served it with new Pink Eye potatoes and snow peas. This recipe is from Pete Evans, we have three of his cookbooks now and I have favourite recipes from each of them. Put the flour in a bowl and season with salt and pepper. Lightly coat the fish in the seasoned flour. Turn the heat up to high and add the butter and cook on high heat for a few minutes, until it just starts to brown. Immediately add the parsley (be careful as it will pop and spit). Allow the butter to colour further for a minute or so. Add a squeeze of lemon juice and allow the butter to foam. 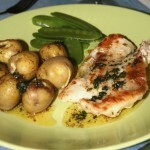 Spoon the butter sauce over the fish (and new potatoes) and serve with lemon wedges. 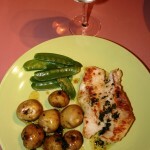 This entry was posted in Quick Week-night Cook, Recipes, Seafood. Bookmark the permalink. Nice blog. Love your recipes!